American Christians host Israeli nationalist leaders to garner opposition to Prime Minister Ehud Olmert's planned establishing a hostile, Muslim state of Palestine- ruled from Jerusalem. This plan involves ceding Judea & Samaria, evicting 300,000 Israelis, and dividing Israel to indefensible borders. The Zionist leaders advocate preserving Israel's safety and integrity through solutions other than Secy Condi Rice is implementing- with Prime Ministers Olmert and Abbas dividing Israel to create a hostile Palestinian state with a capital in a divided Jerusalem. 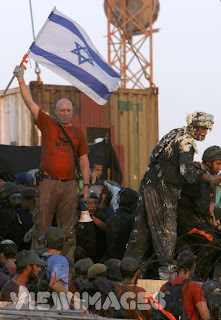 The Israeli speakers include Members of Knesset David Rotem, Elhanan Glazer, and Rabbi Benny Elon (NU/NRP); Hebron pioneer and former MK Elyakim ha Etzni, Colonel Moshe Leshem (pictured leading resistance to ceding Gaza), Rabbi Eliezer ben Yehuda, Arutz Sheva Editor-in-Chief Yedidya Atlas, political-affairs expert Victor Mordechai, and the Knesset Christian Allies Caucas' Josh Reinstein. Watch these videos of Hebron pioneer Elyakim HaEtzni's presentation at the 2006 Days of Elijah symposium- free. US Congressmen Rep. Louie Golmert and (formers) Rep. Dave Weldon will also appear, along with many pro-Israel, Christian leaders, organized by Batallion of Deborah's Jodie and Rev. Keith Anderson, Covenant Alliances, and Christian friends of Assaf ha Rofeh Hospital. The conference is available for videostreaming live and archived viewing. A$ 35 subscription provides access to the videos for on-demand viewing throughout September via this link. Abie Nathan - Israeli peace pioneer, pirate radio station founder and former Royal Air Force pilot - has died in Tel Aviv at the age of 81. Nathan, the communicator who singlehandedly revolutionized mass-media in the Middle-East had suffered 2 strokes over the past dozen years rendering him mute- was hospitalized for five days at Ichalov before his death, Israel Radio reported Wednesday, 27 August. Convinced that people power could succeed where the diplomats had failed, Nathan bought a 188-foot, 570-ton Dutch freighter that was partially funded by John Lennon. He anchored it off the coast of Tel Aviv and turned it into radio phenomenon, The Voice of Peace, playing a mix of Anglo pop songs and peace messages. "Shalom, salaam and peace to all our listeners," Nathan declared in his maiden broadcast in 1973. "The Peace Ship is a project of the people. We hope through this station we will help relieve the pain and heal the wounds of many years of suffering of the people of the Middle East." With its famous jingle, "From somewhere in the Mediterranean, we are the Voice of Peace," the station broadcast from a ship anchored 7-miles off Israel's coast in international waters. It was launched with John Lennon and Yoko Ono's song 'Give Peace a Chance.' Daily at "Twilight Time" it paused for a memorial moment of silence. In its heyday, its all-music format attracted a listenership of tens of millions throughout the Middle-East. After spiraling operating costs of the ship, coupled with declining advertising revenues, The Voice of Peace saw its debts mount to hundreds of thousands of dollars. Rather than sell it, Nathan elected to sink the ship in 1993. He saw the first wish come true when Israel and Egypt signed a peace treaty in 1979. He suffered a stroke in 1996 which left him partly paralyzed, and a second stroke around a year later left him without the power of speech. Confined to a retirement home, he had rarely been seen in public. In a 1996 interview with The Associated Press, Nathan said that during one of his prison hunger strikes, he was certain he was going to die. He bought a grave and a tombstone. When asked what he would want written on the stone, he replied "Nisiti" - the Hebrew for "I tried." Will Moscow arm Iran more because of US interceptor missiles in Poland or Israel having armed Georgia? 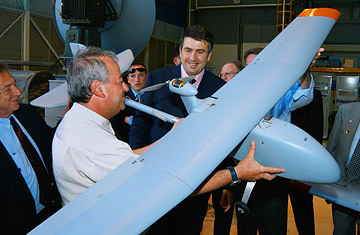 The Russians were piqued by Israel's military trade with Georgia even before the latest outbreak of hostilities — Moscow expressed its annoyance over the pilotless drones supplied by an Israeli company to the Georgians, three of which were downed by Russian aircraft over South Ossetia in recent months. Obviously mindful of the need to avoid provoking Russia, Israel declared off-limits certain weapons systems the Georgians had asked for, such as Merkava tanks and advanced anti-aircraft systems. "We have turned down many requests involving arms sales to Georgia, and the ones that have been approved have been duly scrutinized," a Defense Ministry official told the Israeli daily Yediot Ahoronot amid concerns raised over possible fallout from the Israeli ties to the Georgian military. The extent of damage in the Israeli-Russia relationship — if, indeed there is any — remains to be seen. Despite General Nogovitsyn's comments, Israeli officials say they have received no formal complaints from Russia over ties with Georgia. Israel's strategic priority, right now, is countering the threat it sees in Iran's nuclear program, and on that front, Russian cooperation is essential. If the Israelis are to achieve their objective of forcing Iran to end uranium enrichment through diplomatic coercion, they will need Russian support for escalating U.N. sanctions — a course of action for which Russia has thus far shown little enthusiasm. And if Israel were to opt for trying to destroy Tehran's nuclear facilities through a series of air strikes, then the presence of the sophisticated Russian S-300 missile system in Iran would considerably raise the risk to Israeli pilots. Unfortunately for Israel, however, there may be little it can do to shape Moscow's Iran policy for the simple reason that Israel is not a major factor in Russia's strategic outlook. Moscow's actions on Iran are less likely to be determined by Israel supplying a few drones to Georgia than they are to be shaped, for example, by the deployment over extreme Russian objections of U.S. interceptor missiles on Polish soil. In keeping with the tradition established in 1976 at the Montreal Games, the Israeli delegation to Beijing held a memorial service on Monday in honor of the victims of 1972 Munich Olympics massacre. The ceremony drew considerable attendance, and several high-profile figures came to pay their respects to the memories of the 11 athlete, including members of the current Israeli Olympic delegation, chairmen of the Israeli Olympic Committee, Israel's representative to the International Olympic Committee (IOC), Israel's ambassador to China Amos Nadai, and Minister of Science, Culture and Sport, Raleb Majadele. Also present was the former IOC president, Juan Antonio Samaranch. Samaranch, who during his lengthy tenure as president refused to recognize the victims as part of the heritage of the Games and address their deaths in the various opening ceremonies throughout the years, said: "This murder is the blackest event in the history of the Olympics. It is good to see that despite this Israel continues to move forward and grow, as a nation in general and in regards to its sports in particular." Here is the trailer for Steven Spielberg's "Munich," which traces Israel's campaign to avenge the deaths of the 11 at the hands of Palestinian terrorists. 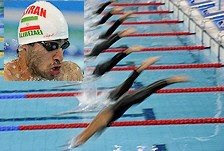 An Iranian swimmer who pulled out of an Olympic race with an Israeli athlete on Saturday will not be punished after International Olympic Committee official credited the Iranian's claim that he withdrew due to illness. Moments before the heats in the men's 100-meter breaststroke on Saturday, Mohammad Alirezaei backed out. He was to face a field that included Tom Be'eri of Israel. A spokeswoman for the IOC, Giselle Davies, initially said Mr. Alirezaei could be disqualified from the Olympics if he refused to participate because of the Israeli competitor, but she said Monday that the committee has accepted Mr. Alirezaei's claim that he was ill. "He confirmed this in writing to the swimming federation. We've also spoken with the national Olympic committee and they have underlined to us that all their athletes compete here in the right spirit against athletes from any nationality," Ms. Davies told the Associated Press. "We take both the athlete and the national Olympic committee at their word on this," she said. In the 2004 Olympics in Athens, Iran withdrew a judo competitor assigned to face an Israeli. However, on Sunday an American-born Israeli who is coaching the Russian basketball team, David Blatt, struck a blow against the Iranian boycott by shaking hands with every member of the Iranian basketball squad, who may not have realized he is an Israeli. A spokesman for the Israeli Embassy in Beijing, Guy Kivetz, had no comment on the IOC decision, but decried the action by the Iranian swimmer. "It's not the first time and, unfortunately, it probably won't be the last time, either," Mr. Kivetz said. "We are very sorry that the athletes are involving politics in sports. I think the water in the pool and the water in the sea are just water and they are for sport not for politics. ... We don't have anything against Iranians, just the extreme Iranian regime." In his swim on Saturday, Mr. Be'eri broke the Israeli record with a time of 1:02.42, but he failed to make the finals, finishing in 4th place.